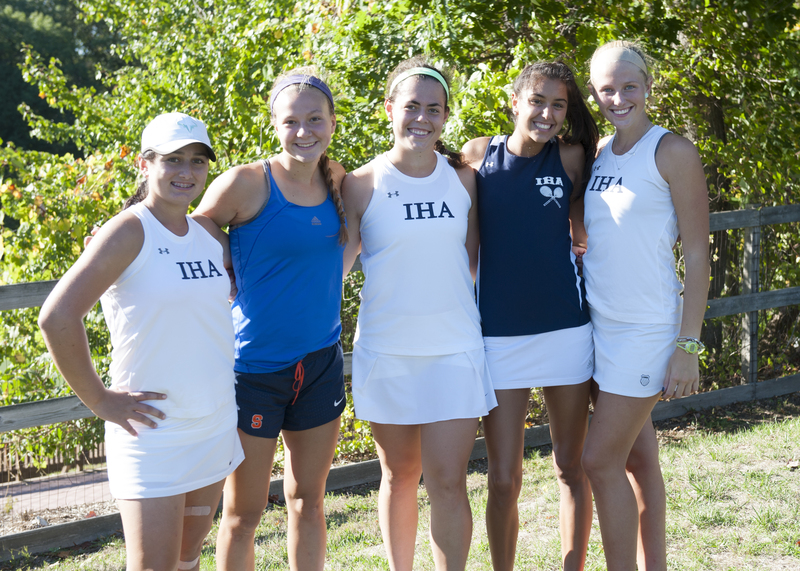 IHA tennis is having an impressive season, despite losing three starting seniors last year. Their record is 12-3, with wins against major rivals such as, AHA and Tenafly, and with close losses to Dwight Englewood and Ridgewood. After a successful State match against Union Catholic this past Tuesday, which was also Senior Day, the Blue Eagles are on to the next round. This past Friday they traveled to AHA for a State Quarter-Final matchup. Katrine Luddy’18 was unfortunately unable to play due to injury. At first singles Gianna Carbone’18 battled one of the top girls tennis players in New Jersey. At second singles, Julia Arcieri’18 played a level up and maintained her game strategy winning 6-0, 6-0. At third singles Emma Walsh’17 played her best and lost a close match to Isabel Shea (AHA). Julianna Zeepvat’17 and Reagan Bossolina’17 at first doubles beat one of their long time rivals 6-1, 6-3. In previous matchups first doubles was always a close match, but this time IHA was able to maintain their play and take the lead quickly. Prior to Katrine Luddy’s temporary absence from the team due to injury, she stated earlier this week, “I have been working so hard this season to become a better singles player both mentally and physically, and I’m ready to show that in these state matches.” Luddy is a major contributor to this team as are the other singles players, Gianna Carbone’18 and Julia Arcieri’18. At second doubles Monti McEachern’17 and Ava Nejad’18 have been having an extremely strong season as well; with wins against AHA and Dwight Englewood followed by an excruciating three set match against Ridgewood, ultimately resulting in a loss for IHA. Similarly to the past season, there will be major holes in the lineup next year with this class of seniors gone. Reagan Bossolina, Julianna Zeepvat, Monti McEachern, Mia Iannelli, and Emma Walsh will all be missed. As Ava Nejad’18 said during their Senior Day celebration, “we are really going to miss them. We were all so close and had such great relationships on and off the courts. Me and the other juniors have big shoes to fill, but I am excited and look forward to my senior year.” Captains Reagan, Julianna and Monti try to get the team ready for their upcoming matches and hope that their hard work will pay off in the upcoming days.